As part of our mission to raise attainment through movement, MovementWorks now offers an extended family learning course called Magic Movers™ - look out for more courses coming soon. MovementWorks offers informative workshops for parents and Early Years carers. These fun sessions provide some theoretical background together with a practical understanding of the links between movement, development and learning. They give insight into how the ability to perform specific movement patterns are essential for school readiness and how to apply this knowledge at preschool and home to support learning in a way that is enjoyable. 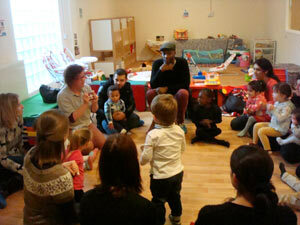 - Parent, Puddleduck Nursery, Nunhead.